We’re thrilled to announce the lineup for our favorite night of the year. HEAVY AND LIGHT is happening once again, Saturday April 1 at House of Blues Orlando. If you aren’t familiar with HEAVY AND LIGHT, it’s our flagship event, an evening of songs, conversation and hope. This year’s lineup includes some familiar faces along with one debut. 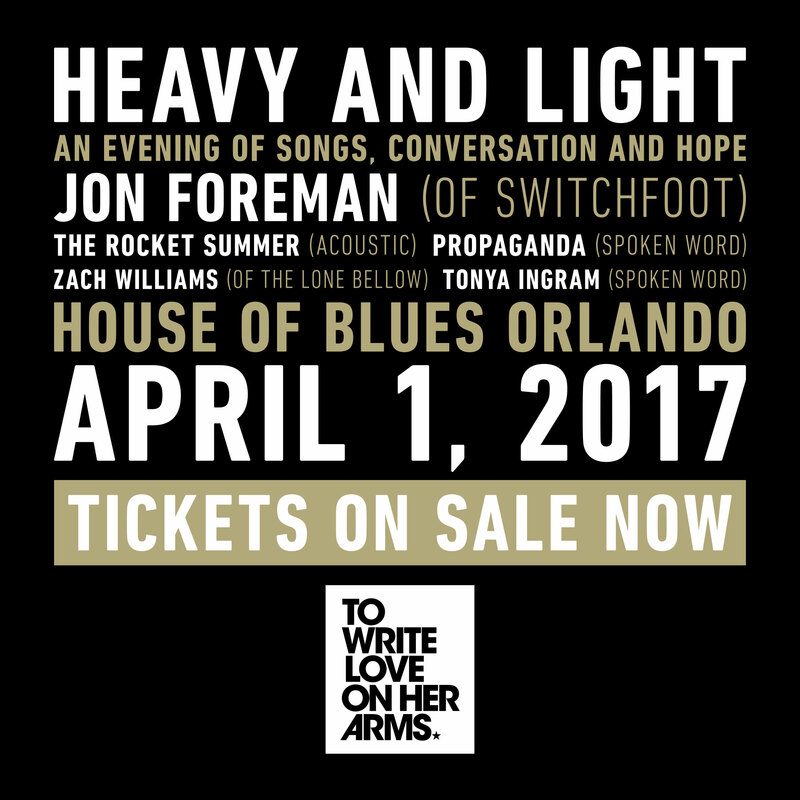 Our dear friend Jon Foreman (of Switchfoot) will be back to headline. It’s been a busy year for Jon, with the release of Switchfoot’s 10th studio album, “Where the Light Shines Through,” which was followed by the band’s Looking for America Tour. Bryce Avary aka The Rocket Summer returns for the first time since the HL USA tour in 2013. After a move from Dallas to Los Angeles, Bryce released his sixth studio album, “Zoetic,” in 2016. We’re honored to have Propaganda in the mix for the first time ever. Prop will be coming all the way from Long Beach, California to perform his spoken word. A lot has changed for our buddy Zach Williams since he made his HL debut in Orlandoback in 2009. When Zach opened the show that year, it was the biggest crowd he had ever played to. Fast forward to 2017 and Zach has enjoyed some incredible opportunities with his band The Lone Bellow. From Bonnaroo to Letterman, it’s been amazing to watch his journey unfold. And last but not least, NYC poet Tonya Ingram stole the show at last year’s HEAVY AND LIGHT. Her honesty and vulnerability set the bar for the entire night and we can’t wait to see what she decides to share this time around. Beyond the artists, HEAVY AND LIGHT always includes compelling speakers, and everyone in the room will leave with a list of local resources; places they can find help in their local community. We hope to see you Saturday, April 1 in Orlando! It’s going to be a great night and we would love to have you there. Leave a comment…i dont know which way to focus or to turn in my life anymore? We hope you are doing well. There’s no doubt that navigating life can be difficult. We hope you will email our team at info@twloha.com so we can learn more about your story and your struggles. It would be an honor to share in your journey and offer you some encouragement. This event has already taken place (April 1, 2017). Keep an eye out in 2018! Thanks for your support!